The twenty-first book in the Poiema Poetry Series is Falter by Marjorie Stelmach. Published February 20, 2017. Marjorie Stelmach is the author of five poetry collections and the winner of the Chad Walsh Prize for the poem selected by Beloit Poetry Journal as their best selection from 2016. She has served as visiting poet at the University of Missouri, St. Louis, and as director of the Howard Nemerov Writing Scholars Program at Washington University. 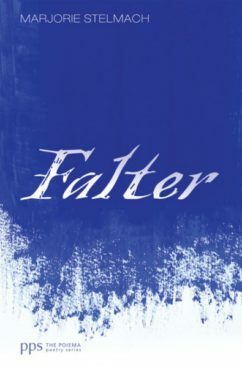 To purchase Falter visit: Wipf & Stock. D.S. 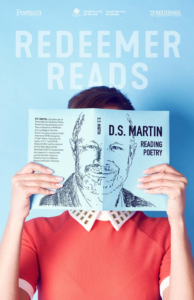 Martin's upcoming Ontario readings include a chapel at Emmanuel Bible College in Kitchener, (October 9th at 11:30 am) - and a reading at Redeemer University in Ancaster (October 11th at 5:00 pm). In his role at McMaster Divinity College he has shared his poetry as part of chapel services. The next occasion will be on Monday October 22nd at 2:00 pm. Writing students at Tyndale University will hear him read and talk about publishing poetry on November 14th. He will also participate in "A Celebration of the Word" at Tyndale at 7:30 on January 25, 2019. D.S. 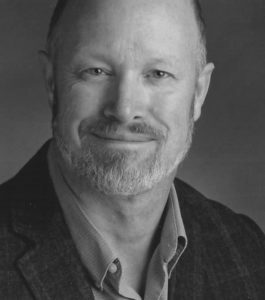 Martin will be a featured presenter at the Windhover Writers' Festival (February 13-15, 2019) at the University of Mary Hardin-Baylor in Belton, Texas. As part of the Gordon in Orvieto program, he will be facilitating an ekphrastic poetry course (March 25-April 18, 2019) in Orvieto, Italy. For information as to how you can get involved, visit the Gordon College website. For eight straight years now, D.S. Martin has blogged, and continues to blog, about Poets and Poetry of the Christian faith on his Kingdom Poets Blog »» Check it out! There's a new post every Monday. Website by Dandelion Web Design Inc.